Bang & Olufsen's kicking it up a gear from its 55-inch Avant tele with the brand new BeoVision Avant 85 - no prizes for guessing, it's 85-inches. The supersize screen is B&O's biggest TV yet, and promises ultra high definition 4K viewing with glorious B&O-stamped audio in tow. "BeoVision Avant 85 is a true state-of-the-art product at a competitive price for a television of this size and level of innovation," says Tue Mantoni, B&O's CEO. 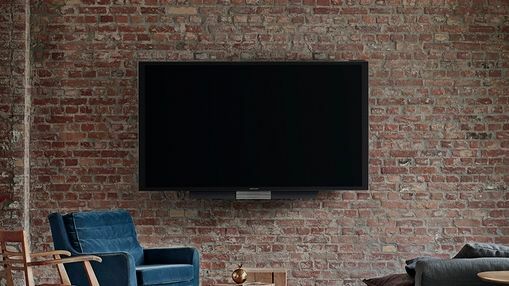 "At Bang & Olufsen we are proud of introducing this grand television to a market that is demanding products offering extraordinary home experiences." And extraordinary the BeoVision 85 most certainly is, offering 'cutting-edge' direct type LED, eight integrated speaker driver units, and a surround sound module. Three audio channels offer stereo sound plus a centre channel for boosted audio. B&O also reckpons its bass and speech reproduction are top notch. For control freaks, there's a dedicated BeoRemote One that B&O says will handle all your A/V goodies like games consoles, DVRs, Apple TV, and more. Even the Remote looks swish, encased in unibody alumium and designed with one-touch access. Once you decide it's time for tele, one-touch the remote and watch the TV emerge courtesy an elaborate folding mechanism. When you're done, turn it off and the speakers will re-fold and the TV returns to its nap position.